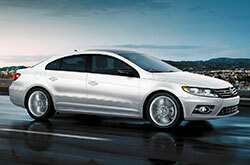 The Volkswagen CC has long been a popular choice among shoppers looking for a polished sports coupe at a good value. From bumper to bumper, the CC boasts a striking design and top-tier convenience features. 2017 Volkswagen CC reviews also favor the sedan's turbocharged powertrain, noting that the vehicle drivers much like a luxury sedan. 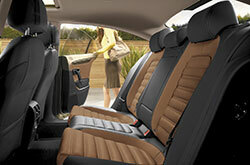 Now available in two well-equipped trims, the CC offers more standard amenities than most other sedans in its class. When you get a glimpse of the 2017 Volkswagen CC in Sanford, you'll notice the 17-inch alloy wheels, LED taillights, bi-xenon headlights and other sleek exterior stylings that rival those of luxury sedans. The cabin is also beautifully crafted with wood-trimmings and comfortable leatherette seating. The heated front seats are designed with lumbar support and can be adjusted twelve ways, and users will enjoy a touchscreen interface with navigation and an app suite along with an 8-speaker audio system. For even more luxuries, the R-Line Executive model adds shiny 18-inch wheels along with genuine leather upholstery, a panoramic sunroof, a color multi-function trip display and ambient interior lighting, to name a few. The 2017 Volkswagen CC near Orlando doesn't just look good--it performs well too. Designed with a special sport-tuned suspension, the CC boasts state-of-the-art handling and steering-response. A 2.0-liter turbo sits under the hood, generating an impressive 200 horsepower and 207 lb.-ft. of torque. Mated to the turbo engine is a six-speed automatic with available paddle shifters for manual gear-switching. The transmission also features a sport drive mode which adds thrilling boost of acceleration. Safety is a top priority on the CC and you're sure to feel secure whether you are navigating city traffic or taking a joyride around backroads. 2017 Volkswagen CC reviews applaud the sedan's standard offerings, which include an airbag system with side curtains, adjustable head restraints, seven stability functions and a rearview camera. A crash response system, post-collision braking system and the Car-Net safety telematics system are also standard. The R-Line Executive model takes safety to new heights with adaptive cruise control, forward collision warning and lane departure warning. Please call 844-879-9584 for further assistance. 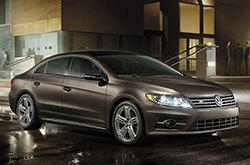 Is the Volkswagen CC Ideal for Your Lifestyle? Don't just mull over the 2017 Cadillac ATS, Acura TLX and the Infiniti Q50 when searching for new vehicle models near Orlando; also be sure to take a long look at the dashing 2017 Volkswagen CC. You could end up loving its first-class cabin amenities and polished exterior design among other aspects. Look over the details from our report to determine if the 2017 Volkswagen CC is ideal for your commuting needs. Also make sure you take a peek at Volkswagen factory offers on our site! 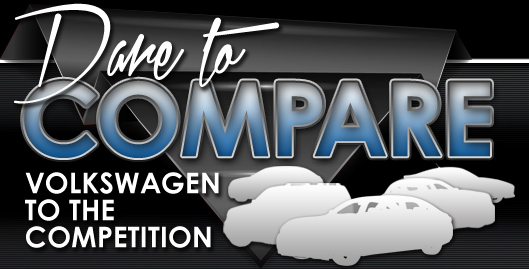 Want to drive a Volkswagen CC and looking for cost-effective manufacturer incentives? Then make a note to visit us next time you're nearby! Our thoroughly researched review makes it easy for you to get access to the details and specs you need, and we hope it helps you when it comes to making a confident vehicle purchase. 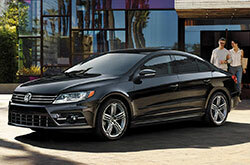 Stop by our car center in Orlando, FL, and get to know the brand-new Volkswagen CC upfront. If you're hoping to see it preceding your visit, view its interior and see how it's furnished in the embedded video. *Taxes, title, registration, administrative fees and Dealer Fee of $799.50 not included. These charges represent costs and profit to the dealer for items such as inspecting, cleaning, and adjusting vehicles,and preparing documents related to the sale. Prices include the listed rebates and incentives. Please verify all information. We are not responsible for typographical, technical, or misprint errors. Inventory is subject to prior sale. Contact us via phone or email for more details. *MPG Based on 2017 EPA mileage ratings. Use for comparison purposes only. Your mileage will vary depending on driving conditions, how you drive and maintain your vehicle, battery-pack age/condition, and other factors.